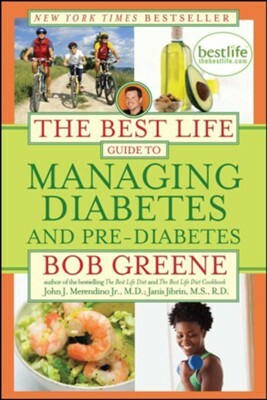 A comprehensive guide to managing diabetes from the author of The Best Life Diet, featuring a three-phase program, meal plans, and recipes—now in paperback. Let Bob Greene help you take control of your health and claim the life you deserve! Bob Greene has helped millions of Americans become fit and healthy with his life-changing Best Life plan. Now, for the first time, Oprah’s trusted expert on diet and fitness teams up with a leading endocrinologist and an expert dietitian to offer a Best Life program tailored to the needs of people with diabetes and pre-diabetes. Coping with the unique challenges of living with these conditions can feel like a full-time job, but The Best Life Guide to Managing Diabetes and Pre-Diabetes gives you a gradual, three-phase plan designed to improve your blood sugar and stave off heart disease, neuropathy, and other diabetes- and pre-diabetes-related conditions. Whether you are controlling your disease simply with diet and exercise, taking drugs orally, or need injected insulin, this comprehensive volume gives you all the information you need to stay healthy and motivated. Detailed but flexible meal plans take the guesswork out of eating, and recipes for budget- and family-friendly dishes come with complete nutritional analyses. Extensive reference sections, including a complete guide to diabetes drugs and a chart of the carbohydrate value of foods, give you quick answers you can trust, while a log for tracking your blood sugar readings, exercise, diet, and medication helps you stay organized without hassle or added expense. With The Best Life Guide to Managing Diabetes and Pre-Diabetes, you won’t have to let your life be defined by your diagnosis. Bob Greene is an exercise physiologist and certified personal trainer specializing in fitness, metabolism, and weight loss. He holds a master's degree from the University of Arizona and is a member of the American College of Sports Medicine and the American Council on Exercise. For the past seventeen years he has worked with clients and consulted on the design and management of fitness, spa, and sports medicine programs. Bob has been a guest on the Oprah Winfrey Show. He is also a contributing writer and editor for O the Oprah magazine, and writes articles on health and fitness for Oprah.com. Greene is the bestselling author of The Best Life Diet Cookbook, The Best Life Diet, Revised and Updated, The Best Life Diet, The Best Life Diet Daily Journal, The Total Body Makeover, Get With the Program!, The Get With the Program! Daily Journal, The Get With the Program! Guide to Good Eating, and Make the Connection. Janis Jibrin, M.S., R.D., is the lead nutritionist for thebestlife.com, Bob Greene’s weight loss and fitness website. She is also a contributing editor for Self magazine, the author of The Supermarket Diet and other weight loss books, and freelances for other national magazines. In her private practice, she specializes in weight loss and eating disorders. I'm the author/artist and I want to review The Best Life Guide to Managing Diabetes and Pre-Diabetes.